Some excellent entries in the competition this week meant our own pull out supplement ended up tossed aside like yesterday's cheese. Plus, Simon has a world changing question about cars, and iszi explains why sunflowers bother. 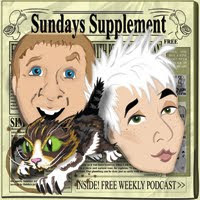 Sundays Supplement is now available on iTunes. So, now you can keep abreast of every single new episode without the bothersome effort of well, effort. Time for your midweek dose of Sundays Supplements. This week has a surprise ending, and as you will discover from our special pull out section, there's nothing I like more than being surprised. Time for another mid-week dose of your Sunday Supplements. We launch our amazing competition, with your chance to win a stack of Hancock's Half Hour DVDs. Plus it iszi's birthday, and we tell you how you can see her naked on a calendar. Our inaugural episode, featuring an Indiana Jones pull out special. Keep an eye out for our iTunes store link, coming soon.